Thunder 102 broadcasts from its studio at the Colonial Square Mall in Liberty, NY. The name change reflects the continued and ever-increasing popularity of Michelle Semerano who joined the program just five short years ago. 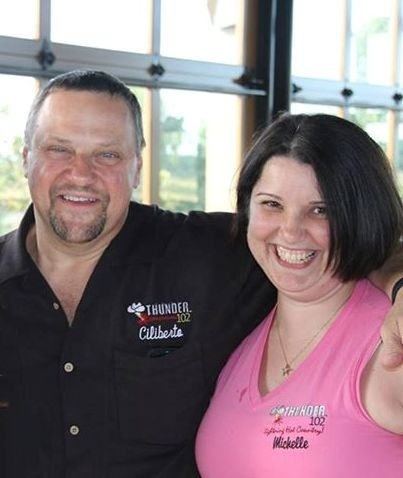 The new “Ciliberto & Semerano” on Thunder 102 will continue building on its awarding-winning tradition. Unique in the Hudson Valley, the show, hosted by Paul Ciliberto and Michelle Semerano, features national and local celebrity co-hosts, on-air and telephone interviews, and a wide-range of information on community, business, media, charitable and social issues, interspersed with news and weather reports, as well as up-to-the-minute emergency information. No radio station offers more proof of that than Thunder 102. Just a sampling of the organizations that have received support from Thunder 102 include: the American Red Cross, Boys & Girls Club of Northern Orange and Sullivan Counties, Autism Speaks, St. Baldrick’s, Relay for Life, Sullivan County food pantries, Sullivan Renaissance, Cornell Cooperative Extension, Toys for Tots, Sullivan County CASA, St. Jude Children’s Research Hospital, and hundreds of other local and national organizations and charities. Supportive of other media in the area, the Thunder 102 morning show also provides weekly updates from The River Reporter, The Times Herald-Record, and the Catskill Chronicle. Not content to broadcast from behind the safety of the microphone, Ciliberto and Semerano also get out into the community, appearing at hundreds of events each year. Both recently took part in the ice-bucket challenge to raise money for ALS, and helped to raise over $66,000 at this year’s Boys & Girls Club Celebrity Dinner. In addition to numerous other awards, Ciliberto was the recipient of the SYDA Foundation’s Community Service Award, and Semerano has been honored for the past few years as Special Guest at the Sullivan County Retired Senior Volunteer Luncheon. Just one year ago, Semerano was named Thunder 102 Program / Music Director. “Michelle is such a big part of the show, and we think the name of the show should reflect that,” said Ciliberto, who also serves as the station’s NY Market Manager & General Manager.